Paul Kaptein cria esculturas de madeira explorando o passado dessa arte e misturando com a realidade dos dias de hoje. Suas esculturas acabam sendo quase atemporais por resultado direto das suas influências.. 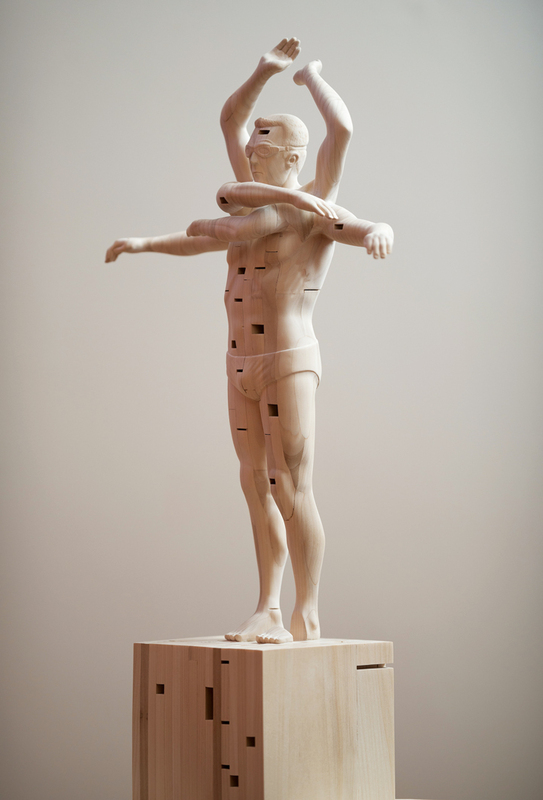 The artist Paul Kaptein based in Australia creates his work in sculpting the wood by hand. Kaptein work is generally figurative, very realistic representations of people often dressed in a hooded cowl. Spectacular representations of light wood to discover below. Paul Kaptein is one of only a few artists I know that has been in Hatched (the national survey of recent graduates held annually at PICA) twice (1999 and 2000). He was in it both as a TAFE graduate and as a Curtin graduate. I mention this only in passing, as it seems appropriate to an artist whose work evolves around a ‘remixed present’. Replaying the moment – graduating twice in two years and reliving Hatched – seems pretty apt (and all very Donny Darko to me). In Paul’s case perhaps this déjà vu becomes the artwork – a shameless and blatant example of disrupting the natural progression of time. Of course this is a simplistic notion – the progression of time that is – in the face of the en-clouding nature of the fabric of this universe. But the constant tension that creates ebbs and flows, springs and strings and the enfolding of material and energetic collapsing that we call time – is just that – a simplistic notion – and the overlapping nature of events, the bizarre consequence of an artist concerned with the materiality of time being in the same place for the same occasion on two different days – suggests that the universe has more than growth and collapse, birth and rebirth to drive it – it also has a wicked sense of humour. This is of course all laid out in the hitchhikers companion to galaxy travel. I feel like I’ve known Paul forever – I met him at Claremont School of Art around 17 years ago, which really is forever I guess. His confounding interest in the immaterial as an expression of the overt reliance (and ignorance of the composition) of materialism as a somewhat naive description of reality has always intersected his fond enjoyment of metaphors, riddles and other transient quips that show a sharp mind dissecting the ineptitude of language. Paul’s desire to work in wood seems perfectly natural to me. Wood’s growth is dependant on the gaps in the universe – pushing through the soil, climbing into space – wood in itself seems to me a not too subtle reminder of how material is made up of much negative space. That Paul has decided to use laminated wood only enhances this feeling – the panels slip and slide, creating their own holes which exasperate the gaps in the fabric of the universe. As Paul puts it – the laminated wood starts the enactment of key principles: expansion and contraction, interconnection and incompleteness. Once again the material processes of Paul’s push toward immaterialism – finding life through the dissection of (material) language. In this sense Paul is asking language, the description of materialism as process in this case, to become the energetic impact of the work, the spark that ignites the fusion that creates transformation (which in itself is form). His figures are alive only under this weight of knowing: of knowing that their hold on temporality is misconstrued as some sort of knowing. Their seeming emergence from the history of art, sub-cultures and sport – of referencing artists, icons and mythologies – of anticipated potential futures – is the counterpoint to their being vehicles toward discussing emptiness, broken data streams, hand skilling, interruptions of information networks… and time/always time. Paul’s work remixes the immaterial into the material, language into disassociation, the artists into the VJ – creation only happens when the natural flow is interrupted – when light is pulled in, when matter is enfolded, when stars die and babies cry. The spaces allow us time to catch breath. Paul’s work, though remixing the present, gives us (at least) two turns to capture the moment. Artiste sculpteur de Perth en Australie. Il a choisi le bois qu’il décline en sculptures très élaborées. Souvent figuratif, le style est très contemporain avec une inspiration “surréaliste” et une grande maîtrise technique.